Buddhism refers to a collection of traditions, beliefs, and practices based on teachings attributed to Siddhartha Gautama, the Sage of the Shakyas, commonly known as the Buddha (the awakened one). The Buddha lived and taught in northern India approximately 2,500 years ago, and since his passing, his teachings have spread throughout the world. The name Buddhism was first introduced by Western scholars about 150 years ago—as they attempted to understand and transmit the teachings of the Buddha to the West. In the Buddha's own days, and as his teachings spread throughout Asia beginning around the 6th century B.C.E., the Buddha's teachings were "known as Dhamma (Sanskrit Dharma), what is right and as it ought to be, also as Buddha-vacana, the word or speech of the Buddha, and also as Buddha-sāsana, the message, teaching, instruction or dispensation of the Buddha." ...is [Buddhism] a religion? Obviously it depends on how one defines 'a religion'. What is certain, however, is that Buddhism does not involve belief in a creator God who has control over human destiny, nor does it seek to define itself by reference to a creed... On the other hand, Buddhism views activities that would be generally understood as religious—such as devotional practices and rituals—as a legitimate, useful, and even essential part of the practice and training that leads to the cessation of suffering. In its long history, Buddhism has used a variety of teachings and means to help people first develop a calmer, more integrated and compassionate personality, and then ‘wake up’ from restricting delusions: delusions which cause attachment and thus suffering for an individual and those he or she interacts with... Buddhism thus essentially consists of understanding, practising and realizing Dhamma. Buddhism is a tradition that focuses on personal spiritual development. The Buddha-dharma is simply a starting point; concepts that if practiced and applied will bring peace, acceptance and freedom from pain. The basic tenets of Buddhist teaching are straightforward and practical: nothing is fixed or permanent, all actions have consequences, and all life is interdependent. It enables people to realize and use its teachings to transform their life experience, to be fully responsible for their lives and to find relief from suffering. There are multiple accounts of the life of the Buddha within Buddhist literature. These accounts generally agree on the broad outlines of his life story, though there are differences in detail and interpretation. The account below follows the broad outline of Buddha's life, according to traditional sources. According to the Buddhist tradition, the Buddha was born in northern India approximately 2,500 years ago to King Śuddhodana of the Shakya clan and given the name Siddhartha Gautama. After his birth, the sages of the kingdom visited the King and prophesied that Siddhartha would either become a great king and military conqueror or he would renounce the material world and become a great spiritual teacher. King Śuddhodana was determined to see his son follow in his own footsteps and become a great king and conqueror, so he attempted to insulate his son from all outside influences. In an effort to assure that his son's spiritual nature was never awakened, the King insulated Siddhartha from all pain and suffering. He was surrounded by wealth and pleasure, his every wish granted. Orders were given that no unpleasantness would intrude upon Siddhartha’s life of courtly pleasures and so all signs of illness, aging, and mortality were hidden from him. Thus, as a young man, Siddhartha wore robes of the finest silk, ate the best food and was surrounded by beautiful dancing girls. He was extremely handsome and he excelled at his studies and at every type of sporting contest. His father arranged for him to marry a young woman of exceptional grace and beauty, Yasodhara. Siddhartha and Yasodhara lived together in peace and harmony for many years. Yet despite all of this, Siddhartha still had not yet been outside the palace walls. His curiosity grew stronger and stronger and he pleaded with his father to allow him to venture beyond the palace gates. Finally, when Siddhartha reached the age of 29, his father relented and allowed him to visit the world outside. Siddhartha ventured beyond the gates with his faithful charioteer Channa and they had a series of encounters known as the four sights. In these encounters, Siddhartha and Channa first encountered an old man, then a sick man, and then a corpse. From these three encounters Siddhartha began to understand the nature of suffering in the world. Finally, they met an ascetic holy man, apparently content and at peace with the world. These encounters had a profound impact on Siddhartha. Through the first three sights, Siddhartha came to understand that despite the luxury of his surroundings, and despite the immense wealth and power of his family, both he himself and everyone he loved would eventually have to face the sufferings of old age, sickness and death. And he was powerless to stop this. Siddhartha was also inspired by the holy man who was seeking a path beyond suffering, and Siddhartha resolved that he too would seek that path in order that he could lead his family beyond suffering. Late one night, Siddhartha ordered Channa the charioteer to drive him outside the palace gates to the edge of the forest. Once there, Siddhartha informed Channa that he was renouncing his royal life to become a seeker of truth. As a sign of his renunciation, Siddhartha cut off his long, beautiful hair and discarded his royal robes. Siddhartha instructed Channa to return to the palace and inform his father of his decision, and he walked off into the forest. Siddhartha sought out the great spiritual teachers of his day. He studied with several teachers, and in each case, he mastered the meditative attainments they taught. But he found that the meditation techniques that he learn from these teachers did not provide a permanent end to suffering, so he continued his quest. He next joined a group of five other ascetics, led by a holy man named Kondañña. For the next several years, Siddhartha practiced extreme austerities along with his five companions. These austerities included prolonged fasting, breath-holding, and exposure to pain. He almost starved himself to death in the process. Eventually Siddhartha realized that he had taken this kind of practice to its limit, and had not put an end to suffering. In a pivotal moment, as he was near death, Siddhartha accepted milk and rice from a village girl and began to regain his strength. He then devoted himself to meditation, taking in the nourishment that he needed, but not more than that. He would later describe his new approach as the Middle Way: a path of moderation between the extremes of self-indulgence and self-denial. At the age of 35, Siddhartha sat in meditation under a fig tree — known as the Bodhi tree — and he vowed not to rise before achieving enlightenment. After many days, he finally destroyed the fetters of his mind, thereby liberating himself from the cycle of suffering and rebirth, and arose as a fully enlightened being. After a period of deep reflection, the Buddha sought out his five former companions (with whom he had practiced austerities). He gave his first teaching to this group of ascetics, in which he explained to them his middle way approach and the four noble truths. The Buddha spent the rest of his life traveling throughout northeastern India and teaching the path of awakening he had discovered. He died at the age of 80 (483 BCE) in Kushinagar, India. Scholars are hesitant to make unqualified claims about the historical facts of the Buddha's life. Most accept that he lived, taught and founded a monastic order, but do not consistently accept all of the details contained in his biographies. It is obviously difficult, therefore, to write a biography of the Buddha that meets modern criteria, because we have very little information that can be considered historically sound... [but] we can be reasonably confident Siddhatta Gotama did indeed exist and that his disciples preserved the memory of his life and teachings as well as they could. The evidence of the early texts suggests that Siddhārtha was born in a community that was on the periphery, both geographically and culturally, of the northeastern Indian subcontinent in the 5th century BCE. The Buddha was born into the "Shakya" clan, which historians believe to have been organized into either an oligarchy or a republic. 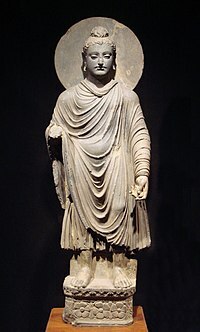 Historians suggest that Siddhartha's father was likely an important figure in the republic or oligarchy, rather than a "king" as described in the traditional biographies. As told in the traditional life story of the Buddha, before his awakening, Siddhartha Guatama had experienced two extremes in life. As a child and young man, Siddhartha had lived a life of great luxury, and all of his earthly desires were fulfilled. Then as a spiritual seeker, Siddhartha had practiced extreme asceticism, denying his body food and comfort. Siddhartha came to realize that neither of these extremes led to a path beyond suffering. It was only when he sought a middle way between these extremes, and focused one-pointedly on meditation, that Siddhartha was able to fully awaken. The Middle Way is a life lived between the extremes of self-denial and self-indulgence and lies at the heart of Buddhism even today. The Buddha wanted his companions to understand that austerity would destroy their health and undermine their ability to realize enlightenment for themselves. To cultivate a moral lifestyle hand in hand with a mindful meditative practice is to walk the Middle Way. Despite the current diversity of Buddhist belief, the Middle Way remains a commonality shared by all. In the Buddha's first teaching, after presenting the concept of the Middle Way, the Buddha introduced the Four Noble Truths. The Four Noble Truths are said to provide a conceptual framework for all of Buddhist thought. These four truths explain the nature of dukkha (suffering, anxiety, unsatisfactoriness), its causes, and how it can be overcome. The second truth is that the origin of dukkha can be known. Within the context of the four noble truths, the origin of dukkha is commonly explained as craving (Pali: tanha) conditioned by ignorance (Pali: avijja). On a deeper level, the root cause of dukkha is identified as ignorance (Pali: avijja) of the true nature of things. The third noble truth is that the complete cessation of dukkha is possible. From the Buddhist point of view, once we have developed a genuine understanding of the causes of suffering, then we can completely eradicate these causes and thus be free from suffering. In the Buddha's first teaching on the four noble truths, he described a path to the cessation of suffering that he called the noble eightfold path. This path consists of a set of eight interconnected factors or conditions, that when developed together, lead to the cessation of dukkha. Ajahn Sucitto describes this path as "a mandala of interconnected factors that support and moderate each other." The eight factors of the path are not to be understood as stages, in which each stage is completed before moving on to the next. Rather, they are understood as eight significant dimensions of one's behaviour—mental, spoken, and bodily—that operate in dependence on one another; taken together, they define a complete path, or way of living. The eight factors of the path are commonly presented within threefold categories of: wisdom, ethical conduct, and concentration. The table below shows how these three categories are used to help understand the eight factors of the path. In the 26 centuries since the life of Shakyamuni Buddha, Buddhism has developed into a diverse religion rich with culture, beliefs and practices that can vary between the different traditions. As Buddhism spread into new regions, it became enmeshed in the regional religious beliefs. New religions sprang up that were Buddhist in appearance but which retained little of the Buddha's teachings. As well, new schools of Buddhism arose that approached the original teachings in fresh new ways. With these changes, questions arose as to the true nature of Buddhism. Regardless of the title, the Three Dharma Seals, the Three Marks of Existence...and the Three Universal Characteristics refer to the same concepts. All schools of Buddhism based on Shakyamuni Buddha's teachings accept these concepts as the core of their beliefs thus distinguishing true Buddhism from other religions that might look like Buddhism. It follows then that any teaching that contradicts theses concepts is not a true Buddhist teaching. Nothing in nature is identical with what it was the moment before; in this the Buddha was close to modern science, which has discovered that the relatively stable objects of the macro world derive from particles that are so ephemeral that they barely exist. To underscore life’s fleetingness the Buddha called the components of the human self skandhas—skeins that hang together as loosely as yarn—and the body a “heap,” its elements no more solidly assembled than grains in a sandpile. But why did the Buddha belabor a point that may seem obvious? Because, he believed, we are freed from the pain of clutching for permanence only if the acceptance of continual change is driven into our very marrow. Suffering (Pāli: dukkha; Sanskrit duḥkha) -- because all conditioned things are impermanent, and because we fail to recognize this and instead cling to things as if they are permanent, there is suffering, pain, unsatisfactoriness, sorrow, affliction, anxiety, dissatisfaction, discomfort, anguish, stress, misery, frustration, and so on. No-self (Pāli: anatta; Sanskrit: anātman) -- upon careful examination, one finds that no phenomenon is really "I" or "mine"; these concepts are in fact constructed by the mind. By analyzing the constantly changing physical and mental constituents (skandhas) of an individual, the practitioner comes to the conclusion that neither the respective parts nor the person as a whole comprise a self. A fourth concept, nirvana is often added to this list, particularly in the Mahayana tradition. Thus, in the Mahayana tradition, the list of four concepts (the three marks + nirvana) is referred to as the four seals. Geshe Sonam Rinchen explains the above quote as follows: "Here Nagarjuna states the Madhyamika or middle way position. Everything that exists does so dependently and everything that is dependently existent necessarily lacks independent objective existence." On the specific level, karma refers to those actions which spring from the volition (cetanā; also "intention" or "urge") of a sentient being. Karmic actions are traditionally likened to a seed that will inevitably ripen into a result or fruition (referred to as vipāka or phala in Sanskrit and Pali). On the general level, contemporary Buddhist teachers frequently use the term karma when referring to the entire process of karmic action and result. Literally nirvāṇa means ‘blowing out’ or ‘extinguishing’ [...] What the Pali and Sanskrit expression primarily indicates is the event or process of the extinction of the ‘fires’ of greed, aversion, and delusion. At the moment the Buddha understood suffering, its arising, its cessation, and the path leading to its cessation, these fires were extinguished. This process is the same for all who reach awakening, and the early texts term it either nirvāṇa or parinirvāṇa, the complete ‘blowing out’ or ‘extinguishing’ of the ‘fires’ of greed, aversion, and delusion. This is not a ‘thing’ but an event or experience. The metaphors associated with nibbāna often liken it to the blowing out of a fire. When it is no longer burning, the fire has “nibbāna’d”—the elements on which it was based are no longer in a state of combustion. This may seem like sterility and lifelessness from the viewpoint of the fire, but from the perspective of the elements it means life and potential. That is, when the fires of greed, hatred, and delusion are extinguished, the mind is free to operate in terms of its fullest capacity. What is the difference between a textual school and a living tradition? A textual school is a school of thought based on a set of texts. It provides the theoretical underpinnings for the living traditions. A living tradition is a tradition (set of beliefs and practices) based upon one or more textual schools. It is common for living traditions to draw on multiple schools or belief systems, or to have different interpretations of the underlying texts. This school emphasizes the threefold training of ethics (sila), concentration (samadhi) and wisdom (panna). This is the philosophical foundation of the Theravada tradition of Sri Lanka and South-East Asia. This is the philosophical foundation of the traditions of East Asia, Mongolia, Tibet and the Himalayan region. This school is a subset of the broader Mahayana school. This is the philosophical basis of Tibetan Buddhism, Newar Buddhism (of Nepal) and some minor sects in Japan and other East-Asian countries. there is a path that can be followed (the fourth truth). Buddhaghosa (c. 5th century) presenting three copies of the Visuddhimagga. The Theravada school is based on the Theravadan Pali Canon and its commentaries. In this school, the Pali Canon is considered to be the original "words of the Buddha". The commentaries were written by later scholars to help organize the teachings of the canon into a coherent system of thought. Both the Pali Canon on the commentaries are written in the Pali language. It systematically summarizes and interprets the teaching of the Buddha contained in the [Pali Canon]... As the principal non-canonical authority of the Theraváda, it forms the hub of a complete and coherent method of exegesis of the [Pali Canon]... And it sets out detailed practical instructions for developing purification of mind. The theory and practice outlined in the The Path of Purification provides the textual foundation of the Theravada tradition of Sri Lanka and South-East Asia. Statue of Nagarjuna from Samye Ling Monastery, Scotland. Nagarjuna was one of the great scholars of the Mahayana school. Mahayana literally means Great Vehicle. The early Mahayana adherents used this term to distinguish themselves from other early buddhists, who they described as followers of the Hinayana (Basic Vehicle) tradition. These are the Mahayana sutras and their commentaries. The Mahayana sutras are based on the texts of the Hinayana (Basic Vehicle), but they were first recorded several hundred years after the Hinayana texts were recorded. The Mahayana texts accept the validity of the Hinayana texts, but they assert that the Hinayana texts present a limited point of view, and that the Mahayana texts present the higher point of view for beings of superior capacity. The texts of the Mahayana school were originally written in Sanskrit, and then translated from Sanskrit to Chinese. The Chinese translations were then translated into Korean and Vietnamese. The Korean translations were then translated into Japanese. At a later period, the texts were also translated from Sanskrit directly into the Tibetan language. The Mahayana path is described as a “gradual path” of the perfections and bhumis as taught in the Mahayana sutras. Generally speaking, this path emphasizes the gradual development of the six perfections of generosity, discipline, diligence, patience, meditative concentration and wisdom. The first five perfections are focused on the development of compassion and love on both an aspirational and a practical level. The final perfection of wisdom focuses on development of direct insight into the true nature of reality. limitless love and compassion for all sentient beings. So is all conditioned existence to be seen. A word of power and the supreme healing. and for every being a source of abundance. Tilopa (988–1069), an influential Indian vajrayana practitioner and teacher. Vajrayana is a system of Buddhist thought based on a set of texts that are referred to as Buddhist tantras. These texts first appeared in Northern India between the 5th and 7th century CE. Vajrayana thought and practice first influenced Buddhist practitioners in Northern India, and then spread to China, Mongolia, and Tibet. From China, the Varjayana texts and practices were transmitted to Korea and Japan. The Vajrayana path builds on the foundation of the Mahayana school. Rupert Gethin states that Vajrayana is “a particular approach to the practice of the Buddhist path occurring within the general Mahāyāna philosophical framework…” Thus, the Vajrayana path includes all the aspects of the Mahayana theory and practice, such as the development of boundless love and compassion, and developing direct insight into the nature of reality. But the Vajrayana path also includes additional “skillful means” to enable a practitioner to reach enlightenment more quickly. Based on the view that nirvana and samsara are not different, the Tantras [the Vajrayana texts] teach that anything – even desire – can profitably be used as a means to liberation. The passions come to be regarded not as inherently wicked but simply as a powerful form of energy which – rather like electricity – can be used for many purposes. The texts of the Vajrayana have been translated from Sanskrit into Tibetan and Chinese, and from Chinese into Korean and Japanese. While Vajrayana practice had reportedly died out in China, today many teachers from the Tibetan tradition teach Vajrayana practice methods in China. In Japan, there are small sects of Vajrayana practitioners remaining from the original transmission. There are some Tibetan teachers teaching in Japan. In the Western countries today, there are also many dharma centers following the Tibetan tradition. The Newar Buddhist tradition of Nepal practices a unique Vajrayana tradition. This is the only tradition that still relies Sanskrit texts for is practice rituals and doctrines. Chinese pilgrims to India around 400 CE reported seeing Mahayana and non-Mahayana monks both co-existing in the same monasteries. [note 17] This seems to have been a process of self-identification, where those monks who were attracted to the Mahayana sutras identified themselves as Mahayana. The East Asian Buddhist tradition was influenced by the native Chinese philosophies of Taoism and Confucianism. The Tibetan Buddhist tradition was influenced by the indigenous traditions such as Bon. In Western countries today, many contemporary Buddhist practitioners are influenced by more than one Buddhist tradition or textual school. When Buddhism spreads it tends not to eradicate existing beliefs but to incorporate them, along with local gods and spirits, into its own cosmology. It is quite common to find Buddhists at the village level [in Southeast Asia] turning to the local gods for solutions to everyday problems – such as curing an illness or finding a marriage partner – and to Buddhism for answers to the larger questions about human destiny. This distinction between the textual schools and the living traditions is expressed by contemporary scholar James C. Dobbins, as the distinction between an idealized religion (of the doctrines) and the practiced religion (the way people live). This distinction between idealized religion and practiced religion is important because there is a widespread tendency to mistake the religious ideal presented in the great doctrinal treatises for the historical reality of how religion was actually practiced. This is not the case. Throughout history there has been a disjunction between idealized and practiced religion. Needless to say, idealized religion informs and shapes practiced religion, and practiced religion likewise modifies and redefines idealized religion. At any particular moment, however, there tends to be a discrepancy between the two. In such circumstances, the ideal should not be mistaken for practiced reality. Hence, when looking at religious documents one needs to be mindful of whether they are prescriptive or descriptive in nature—that is, whether they project an idealized view of religious life or present observations of its actual practice. The Southeast Asian tradition of Sri Lanka and South-East Asia, also referred to as 'southern' or 'Theravada' Buddhism. Its canonical scriptures are preserved in the Pali language. The Tibetan tradition of Tibet, Mongolia and the Himalayan region, also sometimes referred to as 'northern' or 'Tibetan cultural' Buddhism. Its scriptures are preserved in the Tibetan language. Its outlook is broadly that of the Mahayana, but its more specific orientation is that of the Vajrayana (Tantric Buddhism). Within these major traditions, there are a variety of smaller traditions and sects. Southeast Asian Buddhism refers to the Buddhist traditions of Sri Lanka, Burma (Myanmar), Thailand, Cambodia and Laos. While the Theravāda [Southeast Asian] Buddhism of the Sri Lanka and South-East Asia should not be viewed as a uniform and monolithic whole, it does have a certain unity exemplified by the persistence of one main monastic Vinaya lineage and the authority of the Pali canon and its commentaries, inherited from the Mahāvihāra of ancient Anurādhapura. But this is no simple orthodoxy; a variety of interpretations and practices have probably always existed and persist down to modern times. Thus, while each country or region within the Souteast Asian (Theravada) Buddhist world relies on the same core texts, the outer expression of the tradition varies from country to country. In many cases, the practice of Buddhism is intertwined with local religious beliefs. In addition, with the exception of Thailand, the other countries of South-East Asia were colonized by Western powers during the Western colonial era. Thus, modern day Buddhism in these countries is influenced by its response to Western Christian missionaries. For example, in Sri Lanka the response to Christian missionary attempts included a reformation movement that encouraged lay Buddhist practitioners (non-monastics) to study the dharma and practice meditation. Theravada, practiced in Southeast Asia, emphasizes the practice of mindfulness meditation. This is done by focusing on the breath and the sensations in the body while sitting, and on the movements and intentions to move while walking extremely slowly. With mindfulness of the arising and falling of each moment, one gains an experiential realization of impermanence. When this understanding is applied to analyzing all one's experience, one realizes that there is no permanent, unchanging self that exists independently of everything and everyone else. All is momentary changes. In this way, one gains an understanding of reality that will liberate oneself from self-centered concern and the unhappiness it brings. Theravada also teaches meditations on immeasurable love, compassion, equanimity and joy, but only in the last decades has it had a movement of what is called "Engaged Buddhism," starting in Thailand, for engaging Buddhists in programs of social and environmental help. The East Asian Buddhist tradition (aka 'Eastern Buddhism') is a broad category that refers to the Buddhist traditions of China, Japan, Korea, and Vietnam. All these traditions share a common basis of the Chinese Buddhist canon, which is grounded in the Mahayana school. For the most part, the sub-traditions within Korea, Japan, and Vietnam derive directly from corresponding sub-traditions within Chinese Buddhism, although they eventually developed distinctive local traditions. Buddhism first entered China via the "Silk Road" routes through central Asia sometime during the Han dynasty (206 BCE-220 CE). From China, Buddhism entered the Korean peninsula in the fourth century, and then Japan in the sixth century. Buddhism also entered north Vietnam from China during the third century. Buddhists performing prostrations in front of Jokhang Monastery, Lhasa. This approach is combined, in Tibet, with the Indian Buddhist tradition of tantra practice, in which one uses the powers of the imagination and works with the subtle energies of the body to transform oneself into a Buddha. This is done by concentrating on voidness (emptiness) and compassion, and within that context, imagining oneself to have become a specific Buddha-form. Although such forms are sometimes called "meditation deities," they are not the equivalent of God in meaning or function, and Buddhism is not in any way a polytheistic religion. Each Buddha-form is a symbolic representation of one aspect of a Buddha's enlightenment, such as wisdom or compassion. Visualizing oneself in such a form and reciting the sacred syllables (mantras) associated with it helps one to overcome one's deluded, negative self-image and to develop the qualities embodied by that figure. Such practices are very advanced and require close supervision by a fully qualified teacher. ↑ The term world religion is used here to refer to religions that are not limited to a specific location, tradition, or ethnic group. Dzongsar Jamyang Khyentse states: "Although essentially very simple, Buddhism cannot be easily explained. It is almost inconceivably complex, vast, and deep. Although it is nonreligious and nontheistic, it’s difficult to present Buddhism without sounding theoretical and religious." B. Allan Wallace states: "When we in the West first engage with Buddhism, it is almost inevitable that we bring out one of our familiar stereotypes and apply it to Buddhism, calling it simply a ‘religion.’... But Buddhism has never been simply a religion as we define it in the West. From the very beginning it has also had philosophical elements, as well as empirical and rational elements that may invite the term ‘science.’"
Rupert Gethin states: "I am not concerned here to pronounce on a question that is sometimes asked of Buddhism: is it a religion? Obviously it depends on how one defines ‘a religion’. What is certain, however, is that Buddhism does not involve belief in a creator God who has control over human destiny, nor does it seek to define itself by reference to a creed; as Edward Conze has pointed out, it took over 2,000 years and a couple of Western converts to Buddhism to provide it with a creed.12 On the other hand, Buddhism views activities that would be generally understood as religious—such as devotional practices and rituals—as a legitimate, useful, and even essential part of the practice and training that leads to the cessation of suffering. Walpola Rahula states: "The question has often been asked: Is Buddhism a religion or a philosophy? It does not matter what you call it. Buddhism remains what it is whatever label you may put on it. The label is immaterial. Even the label ‘Buddhism’ which we give to the teaching of the Buddha is of little importance. The name one gives it is inessential. In the same way Truth needs no label: it is neither Buddhist, Christian, Hindu nor Moslem. It is not the monopoly of anybody. Sectarian labels are a hindrance to the independent understanding of Truth, and they produce harmful prejudices in men’s minds." ↑ Note that the term middle way is also used to indicate the middle ground between certain metaphysical views (for example, that things ultimately either do or do not exist). ↑ 4.0 4.1 4.2 See the article Four Noble Truths for further details and citations. ↑ For clarification of translations, see Dukkha#Translating the term dukkha. ↑ See the article Dukkha for further details and citations. ↑ For citations and further clarification, see Dukkha#Neither pessimistic nor optimistic, but realistic; in particular, see the footnotes in this section for detailed information on sources. ↑ See the article Pratītyasamutpāda for further details and citations. ↑ Pratityasamutpada can also be described as follows: that all phenomena are arising together in a mutually interdependent web of cause and effect. When one cause changes or disappears, the resulting object or phenomenon will also change or disappear, as will the objects or phenomena depending on the changing object or phenomenon. ↑ Thich Nhat Hanh also refers to this reality of mutual interdependence as 'Interbeing'. The Dalai Lama states: "...the meaning of pratityasamutpada is that which arises in dependence upon conditions, in reliance upon conditions, through the force of conditions. On a subtle level, it is explained as the main reason why phenomena are empty of inherent existence." Nan Huai-Chin states: "Buddhist ontology points out that all relative phenomena arise and disappear through processes of cause and effect: this is called "interdependent origination" (Sanskrit: pratityasamutpada; in Chinese yuan ch'i). Accordingly, all such phenomena are dependent on the (temporary) linking of causal factors that bring them into existence and maintain them, and thus they have no stable, absolute identities independent of the web of causation. Lacking absolute independent entities they are said to be inherently empty". Jay Garfield states: "That all phenomena are dependently originated is the heart of the Buddhist ontological theory." ↑ See the article Samsara for further details and citations. ↑ 14.0 14.1 See the article Karma in Buddhism for further details and citations. ↑ Nirvana is described as extinguishing the fires of attachment (raga), aversion (dvesha) and ignorance (moha or avidya). Rupert Gethin states: "Literally nirvāṇa means ‘blowing out’ or ‘extinguishing’ [...] What the Pali and Sanskrit expression primarily indicates is the event or process of the extinction of the ‘fires’ of greed, aversion, and delusion. At the moment the Buddha understood suffering, its arising, its cessation, and the path leading to its cessation, these fires were extinguished. This process is the same for all who reach awakening, and the early texts term it either nirvāṇa or parinirvāṇa, the complete ‘blowing out’ or ‘extinguishing’ of the ‘fires’ of greed, aversion, and delusion. This is not a ‘thing’ but an event or experience." Paul Williams states: "[Nirvana] means 'extinguishing', as in 'the extinguishing of a flame', and it signifies soteriologically the complete extinguishing of greed, hatred, and fundamentally delusion (i.e. ignorance), the forces which power samsara." Ajahn Sucitto states: "By the extinguishing of the “three fires” of greed, hatred, and delusion, nibbāna gives tangible results in terms of other people’s welfare." Smith and Novak state: "Nirvana is the highest destiny of the human spirit and its literal meaning is “extinction,” but what is to be extinguished are the boundaries of the finite self and the three poisons that feed that self: “The extinction of greed, the extinction of hate, the extinction of delusion: this indeed is called Nirvana.”"
Bhikkhu Bodhi states: "The state of perfect peace that comes when craving is eliminated is Nibbāna (nirvāṇa), the unconditioned state experienced while alive with the extinguishing of the flames of greed, aversion, and delusion." ↑ Note that Theravada commentaries such as The Path of Purification are not included within the Basic Vehicle texts of the Mahayana school. ↑ See account of the monk Faxian, for example. Robinson & Johnson (1982) categorize "Buddhism Outside of India" as: "The Buddhism of Southeast Asia", "Buddhism in the Tibetan Culture Area", "East Asian Buddhism" and "Buddhism Comes West". Southern (Theravada), eastern, and northern. ↑ See the article Timeline of Buddhism for further details and citations. ↑ Horn 1997, p. 263. ↑ Lama Surya Das 1997, p. 16. ↑ Dzongsar Jamyang Khyentse 2011, p. 2. ↑ Goleman 2008, Kindle Locations 1301-1305. ↑ 5.0 5.1 Gethin 1998, p. 65-66. ↑ Keown 2000, Kindle Locations 361-372. ↑ Walpola Rahula 2007, Kindle Locations 316-323. ↑ Harvey 2012, p. 2. ↑ Anderson 2013, Kindle Locations 286-294. ↑ Corless 1989, p. 4. ↑ Anderson 2013, Kindle Locations 364-367. ↑ Skilton 1997, p. 25. ↑ Lopez 1995, p. 6. ↑ Carrithers 1986, p. 10. ↑ Armstrong 2004, p. xii. ↑ 17.0 17.1 Gombrich 2002, p. 49. ↑ Ajahn Sucitto 2010, pp. 21-22. ↑ Kohn 1991, pp. 131, 143. ↑ Anderson 2013, Kindle Locations 563-567. ↑ Ringu Tulku 2005, p. 32. ↑ 23.0 23.1 Ajahn Sucitto 2010, p. 87-88. ↑ Gethin 1998, p. 82. ↑ 25.0 25.1 Anderson 2013, Kindle Locations 972-984. ↑ Smith & Novak 2009, p. 57. ↑ Thich Nhat Hanh 1999, p. 221-222. ↑ Dalai Lama 1992, p. 35. ↑ Edelglass 2009, p. 26. ↑ 31.0 31.1 Geshe Sonam Rinchen 2006, p. 21. ↑ 33.0 33.1 Gethin 1998, p. 75. ↑ Williams 2002, pp. 47-48. ↑ 35.0 35.1 Ajahn Sucitto 2010, p. 163. ↑ Smith & Novak 2009, pp. 51-52. ↑ Bhikkhu Bodhi 2011, p. 25. ↑ 39.0 39.1 Gethin 1998, p. 268. ↑ Keown 2000, chapt. 6. ↑ 41.0 41.1 Keown 2000, Kindle Locations 1311-1315. ↑ Dobbins 1991, p. 109. ↑ 43.0 43.1 Gethin 1998, p. 2. ↑ Gethin 1998, p. 3. ↑ Gethin 1998, p. 253. ↑ Gethin, Rupert (1998-07-16). The Foundations of Buddhism (p. 257). Oxford University Press. Kindle Edition. These are general sources that are not cited in the article. This list is by nature arbitrary. This article includes content from Buddhism on Wikipedia (view authors). License under CC BY-SA 3.0.